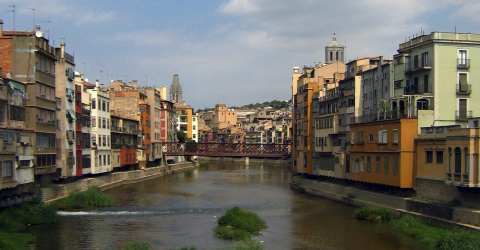 The origins of the city of Girona date back to Roman times. The Goths settled here around the 6th century. Around 900, there was a larger Jewish community here, which still characterizes some parts of the city today. In 1939, Franco's troops conquered Girona. Book the Gaudí Excursion to Girona and Figueres and get to know Girona during a guided tour. You will often be able to read two spellings of Girona: "Gerona" is the name of the city in Spanish, "Girona" is the Catalan name. Girona is the capital of the province Girona. With about 75,000 inhabitants it is a bit more contemplative than Barcelona. In the old town of Girona, east of the Rio Onyar, you can walk in narrow alleys. Newly renovated, this part of the city is quite colorful. The Moors built public baths in the 13th century, modeled after their North African homeland, the Banys Arabs. These baths are still very well preserved and can be visited. One of Spain's most beautiful churches is the Cathedral of Santa Maria of Girona. 30 chapels surround the cloister inside the church. The Cathedral of Girona was built between the 14th and 16th centuries. Many treasures can be seen in the museum, which can be reached from inside the church. Behind the cathedral the old city wall begins, where you can walk from 8:00 to 22:00. The tour (Passeig de la Muralla) is well signposted. From there you have a wonderful view over the city. You can reach Girona by car via the A7, which leads directly to the French border. If you drive straight to Barcelona, you can make a detour here or on the way back. It is about 70 kilometres to Barcelona. From Barcelona trains run regularly to Girona from Sants Station. From Girona you can take a bus to Girona Airport. The bus leaves from the train station. If you want to travel to Girona from Barcelona, do not drive to Girona, you can take the shuttle bus directly. Here you will find directions from Barcelona to Girona Airport.